As befits the week after SXSW, many of the new music releases were featured at the music conference. I caught one of Destroyer's sets, and it was the musical highlight of my trip. 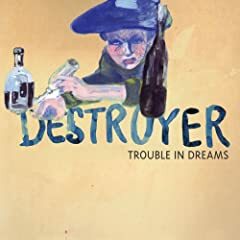 The band's new disc Trouble in Dreams is another gem from the songwriting genius of Dan Bejar. Of the remaining new releases, many are outstanding, but the surprisingly interesting M. Ward & Zooey Deschanel collaboration She & Him's Volume 1, DeVotchKa's A Mad and Faithful Telling, the Kills' Midnight Boom, and Sera Cahoone's Only as the Day Is Long are the ones I have been recommending most. Interesting reissues this week include two Mogwai discs, EP + 6 (remastered) and Kicking a Dead Pig (remastered with bonus disc), but the reissues of the week belong to Mission of Burma. Matador Records (who always do reissues right) have remastered three MoB albums: Horrible Truth About Burma, Signals, Calls and Marches, Vs., and each features bonus discs filled with live tracks, demos, and rarities. What new music are you picking up this week? Have I left anything off the list? The A.K.A.s (Are Everywhere! ): Everybody Make Some Noise!